Thirty years ago, in the summer of 1985, Woodfield Theatre was in its prime and was showing two fun, summer blockbusters. In these photos from contributor Johnny Kunzer, Plitt Theatres 1 & 2 are clearly visible from the parking lot of Woodfield Mall. 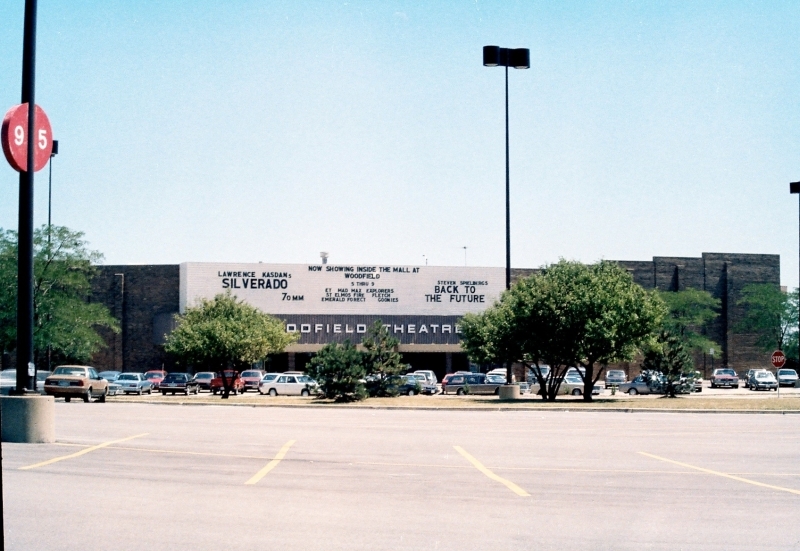 The theaters opened in the summer of 1971 and were demolished in 1999. Cinema 1 originally sat up to 1075 people in comfortable rocking chairs and was a wonderful place to view blockbusters like Back to the Future. Both theaters had huge screens with 70 mm film features and Dolby stereo sound. 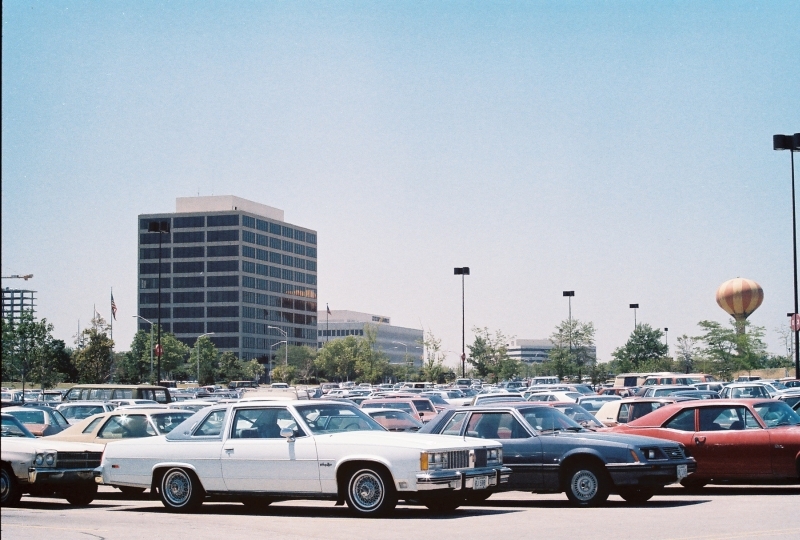 The following two photos are demonstrative of the many office buildings springing up all over Schaumburg in the 1980s. One Woodfield Place at 1701 E Woodfield Rd is the oldest building in the photo, having been finished in 1974. The then-named Citicorp bank building at 1699 E. Woodfield Road was completed in 1984. Woodfield Financial Center is on the corner of Meacham and Woodfield Rd and was completed in 1985. You can also glimpse the construction of the Schaumburg Corporate Center at 1501 E. Woodfield Road on the far left. This property was completed in 1986. Notice the height of the trees for these recently built buildings. The NEC building is under construction at 1750 E. Golf Road. The Woodfield Executive Center at 1101 Perimeter Drive is the building most prominently featured and was completed in 1978. 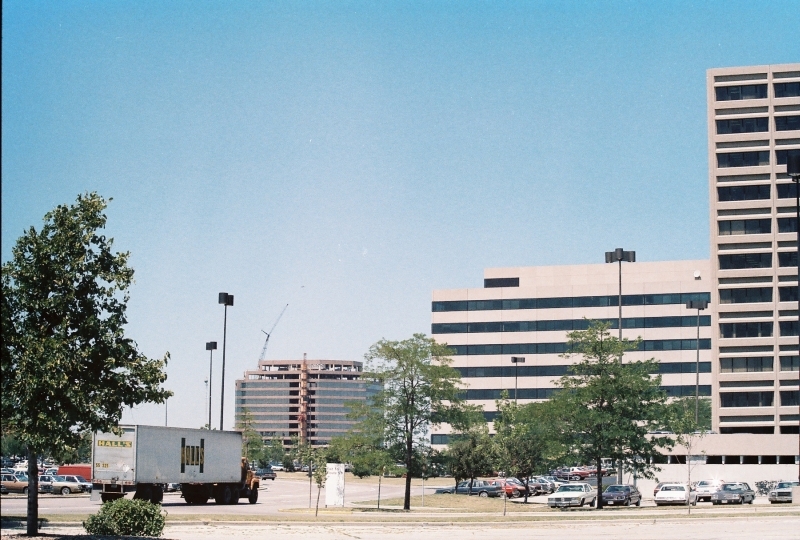 The Woodfield Executive Plaza at 1051 Perimeter Dr is the oldest in the photo, having been completed in 1973. Great photos taken on a great day in the summer of 1985 with a camera and telephoto lens. Thank you, Johnny, for a little walk back in time!